Just as developing her technique of hypnosis came slowly and with great patience, so too did the answers to these questions. After many years of practice and investigation, Dolores eventually realized that the memories of past lives and the additional information she was receiving through clients was being supplied by a much larger, more powerful and more knowledgeable portion of her clients’ selves, which their conscious minds were completely unaware existed. She decided to label it The Subconscious as it was a part of every person”s mind that absolutely exists, but lays just below the level of our conscious minds, observing. When contacted and communicated with, there is simply no question it cannot answer about an individual”s current life, or about any of their past lives. After developing and refining her technique over many years, replacing time-consuming and tedious induction methods with an approach that involves the use of voice, imagery and visualization, Dolores established her Quantum Healing Hypnosis Technique℠. This technique enables direct contact and communication with the Subconscious of any individual for answers to any questions and can also provide the basis for instant healing. Throughout the mid to late 1980s, Dolores work slowly began taking her in a completely new direction of exploration. She was introduced to the area of UFO and ET investigation in 1985 when she attended her first annual meeting for MUFON (Mutual UFO Network), one of the largest and most respected investigative UFO organizations in the world. One year later, Dolores’ interests took her to the United Kingdom where she conducted on-site studies of suspected UFO landings and investigated numerous crop circles found in the English countryside. In 1987, at one of the annual MUFON meetings, she was asked to conduct a session with a woman who felt she was having abduction experiences but lacked the ability to remember anything in detail. Up until this point, Dolores’ hypnosis technique automatically propelled her subjects backwards into a past life. She had to modify her approach to keep her from going into a past life to concentrate on current events. As a result of the interest in this woman and Dolores herself, over 30 observers were allowed to attend the session, which was far from a conducive environment for an “experiment.” Amazingly, both the diversion from her usual approach and the highly unusual environment the session was held in worked very effectively and produced some amazing results. Other books which were published as a result of Dolores’ explorations into the fields of UFO activity and Extra-Terrestrials include Legacy From The Stars (1996), which explores the vastness of our individual beings and our off planet origins, and the Legend Of Starcrash (1994), which describes a life where a woman is regressed back to a time when a spaceship crashed in the Alaska/Canada region thousands of years ago. It is the story of the origin of the Indian races in America. After more than 30 years of investigation and writing about concepts ranging from life and death, reincarnation, the origins of humanity, UFOs and extra-terrestrials, the prophesies of Nostradamus and a wide variety of other topics, Dolores began to realize that the information she was receiving was becoming too broad and diverse to categorize into one, or even several, specific areas. As she has had to adapt to change her entire career, she decided to publish her new work in a series entitled The Convoluted Universe. Dolores has currently published 5 volumes and states that these books are for those people who want their minds bent like a pretzel. Please visit the Books section to learn more about what you can expect to find in each volume. 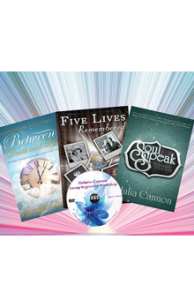 After Dolores Cannon’s passing, her daughter Julia Cannon, who taught QHHT® by Dolores’ side for many years, became Director of Quantum Healing Hypnosis Academy which teaches Dolores Cannon’s Quantum Healing Hypnosis Technique℠ online and around the world. Julia is also the CEO of Dolores’ publishing company, Ozark Mountain Publishing, Inc., which Dolores founded in 1992 to publish her books and other authors exploring, researching and writing about metaphysical subjects. Julia Cannon brings with her in depth experience in the health care field having worked as a registered nurse in Intensive Care and Home Health for the duration of her 20+ year career. She then decided to explore other aspects of the healing profession and has trained in Reconnective Healing while mastering QHHT®. Her energy healing has taken on its own dimension and has formed into something she calls “Lightcasting.” Intuitive lights come from the hands to direct energy where it is needed to balance any deficiencies in the body. This balancing may be happening on the physical, mental and spiritual level. While she is working in someone’s energy field, she gets intuitive messages and impressions of what is happening and what is needed to help the person bring about their healing. With her extensive experience in health care and the after working with Dolores Cannon practicing and teaching QHHT®, Julia authored the book “Soul Speak: The Language of Your Body,” intended and written as a guide to decode the messages from the different systems of your body and how you can heal any situation by understanding the message that is being delivered and acting appropriately on it.